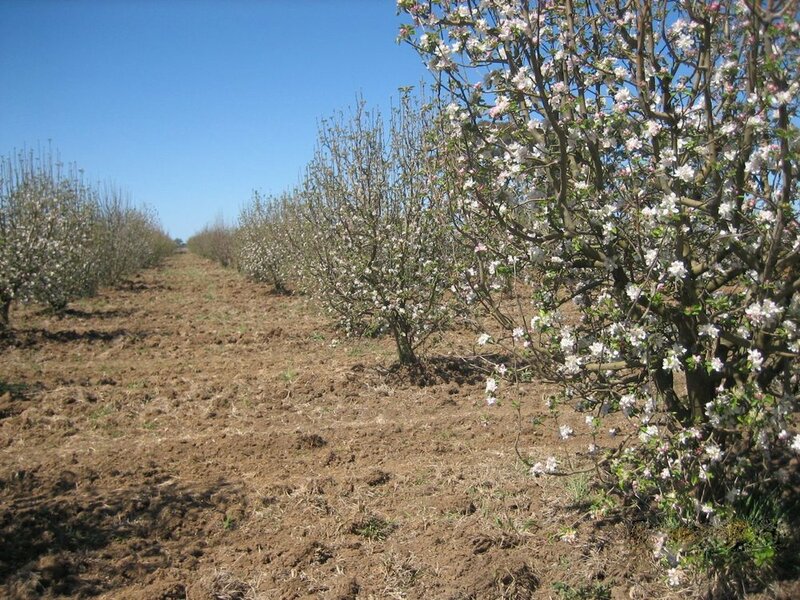 Greenwood Orchards at Merrigum in the Goulburn Valley, 160 km north of Melbourne is probably the only orchard in Australia that has never used a single application of artificial fertiliser. Lynton’s grandfather Hal, established the orchard at Merrigum in 1906 when the irrigation channels came through, on what had previously been a dryland farm. When Lynton’s father, Farry, took over, orchardists in the area were still only using organic fertilisers. Lynton remembers helping Farry spread poultry manure by horse and cart at the rate of one shovelful per tree. In the 1930s, the Victorian Agriculture Department was still advising orchardists to use traditional, proven soil management techniques such as green manuring. As artificial fertilisers were adopted by many orchardists, Farry preferred to stick with the proven annual shovelful of poultry manure together with green manuring on the 142 acre orchard. The main markets for their apples (42 acres) and pears (100 acres) were Europe and the Sydney markets. Some chemical applications were required, by regulation, to keep fruit clean and kill codlin moth. The organic market didn’t develop to any extent in Australia until the mid 1980s. 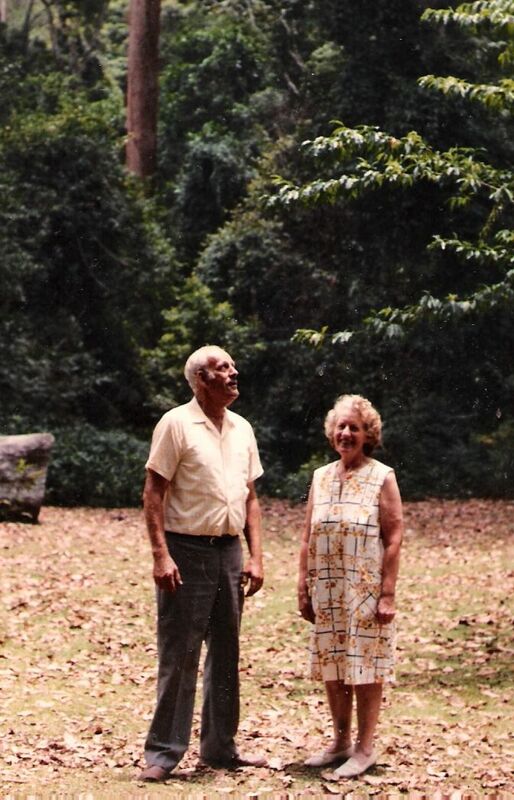 In 1964, Farry converted to Biodynamics, under the guidance of Alex Podolinsky. Apart from the usual improvement in soil structure, humus levels and colour, the Greenwoods noticed that the native trefoil (a legume), which had not been very obvious for years, came back strongly after the first application of 500. In the early years, Demeter certification (the first organic certification in Australia) catered for growers who were required to spray some chemicals for market requirements, by providing a Grade C certification in addition to Grade A (fully Biodynamic), and Grade B (Biodynamic in conversion). Grade C was later withdrawn as the organic industry and the organic market developed sufficiently. During these years, Farry used limited chemicals at half recommended rates. Farry became a leading Biodynamic practitioner and a BD advisor of enormous influence. He was a creative innovator – after World War II, Australia was booming and materials and equipment were difficult to get. In the 1950s Farry built many pieces of equipment including the heavy disc plough still used on the orchard today and a battery forklift. He built a mudbrick cool store with three foot thick walls, and a huge shed supported by concrete columns, using 44 gallon drums to contain the concrete. Farry’s wife Audrey was an active participant in the life of the orchard until her late 80s, (she died in 2008 at the age of ninety, still sharp as a tack), had a warm and profound influence on many people’s lives far and wide, and had an immensely encouraging influence on the development of the Biodynamic Agricultural Association of Australia over the years. She was warmly known as the “grandmother” of the BDAAA. After Farry’s death in 1986, Lynton and his wife Joan took over the running of the orchard. He immediately stopped spraying chemicals on the 40 acre block nearest the house, and progressively stopped spraying the rest of the orchard in the following years. This decision resulted in the immediate loss of the Sydney markets - an inspector found a codlin moth in a pear and he was banned. A few difficult years followed, with much hard work marketing the Biodynamic fruit in a still fledgling organic market. The organisation of the export of Demeter fruit to Europe helped immensely, resulting from Alex Podolinsky’s three year struggle with entrenched interests and government bureaucrats. Eventually, the then federal Agriculture Minister, John Kerin, a great support to Alex, circumvented the bureaucrats. 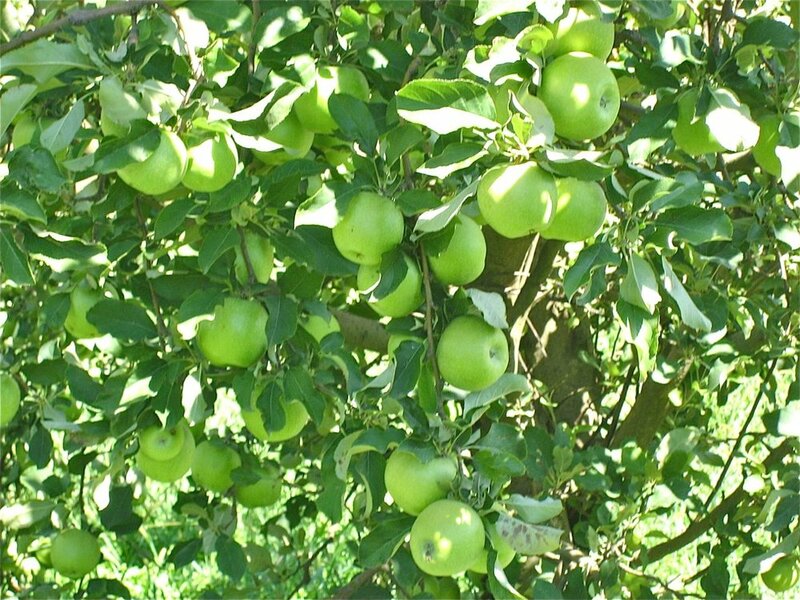 Apple varieties grown are mainly Granny Smiths, Golden Delicious, Pink Lady, Fuji, Raeburn and Sundowners, while pears include Packham, Williams, Winter Nelis, Buerre Bosc, Josephine and Red Sensation. In 2008, Lynton and Joan bought an extra 35 acre orchard block nearby, which borders the township of Merrigum, and began Biodynamic conversion. The fruit from this new block is now fully Biodynamically certified. Greenwood’s is a good illustration of the minimal inputs required on Biodynamic farms in many situations. The only fertiliser input until BD conversion was one shovelful of poultry manure per tree per year. After BD conversion, Farry made compost for 5 years and applied it to the orchard in 1965-70. No fertiliser inputs at all were used after that (except the Biodynamic preparations) until the late 1970s, when Lynton applied some cow manure one year. About 2001, he applied 150kg of reactive rock phosphate per acre and the same amount of lime. He repeated this in 2002 and has used very little since. Green manure crops are the main providers of nutrients to the trees. Lynton grows two green manure crops annually. In autumn, oats, trefoil and clover come up (usually from last year’s crop, which is allowed to develop seed) and grow through winter. Ideally, the crop is slashed in spring, irrigated once and allowed to regrow and fully express itself, maturing its seed. This is not ideal from a green manuring point of view but means it doesn’t have to be re-sown each year. It is then cultivated in with a home-made heavy disc plough that cultivates 100mm deep across and along the rows. If enough water is available, Lynton flood irrigates four weeks after cultivating. This gets the soil boiling over with activity, consuming the organic matter, and giving the trees a big lift. Another green manure then initiates, consisting of summer grasses, wild millet and seteria. This grows for 6-8 weeks to 350mm high on two or three irrigations and is cultivated in mid to late December. This crop takes from the trees in spring but gives the trees an enormous boost after cultivating. Pears grow more in the last four weeks before harvest than at any other time, so this second cultivation gives the trees a boost at just the right time. The summer grasses germinate again (there is still enough seed in the ground) and are allowed to set seed after the fruit is off the trees in March. The native trefoil germinates with this second crop of summer grasses and as they die down in the autumn, the trefoils burst through - by May there is a good covering. In autumn the green manures are not cultivated, but slashed. Prepared 500 is normally sprayed within four weeks of cultivation in spring, after irrigation, and in autumn, after slashing. A reciprocating spray rig is used, which puts out big droplets, the tractor driving down every second row. 501 is applied in spring when there is excessive rain or long periods of overcast, warm, humid weather. 501 is sprayed out with a home-made sprayer which feeds the 501 liquid into a stream of air which finely atomises it, shooting it up 20 metres high, to drift down over the foliage. Lynton has tried growing the trees in permanent pasture, and this method can work well too, though it requires plenty of irrigation water. The pasture is slashed every 30 days to keep it growing dynamically. The difficulty with this method is to maintain the clover balance. There is a tendency for the clovers to gradually give way to grasses such as paspalum which directly compete with the trees. As Lynton and I walked over the orchard it was like walking on a mattress. The photos can’t do justice to the rich, compost-like soil or the beautiful rubbly structure of the cultivated ground. An extended drought continued for over 10 years in the early 2000s. Average rainfall in the area is around 400mm but during the drought it was more like desert rainfall. The first year of heavy water restrictions was 2002, although for the previous 5 years, Lynton was restricted to 100% of his water entitlement. In 2008 the opening allocation was only 4%, later increased to 11%. Fortunately, Lynton was able to buy an extra 95 megalitres and the harvest ended up being very successful, even though it was really an off year, with lower numbers of Packhams and apples. However the fruit was of very high quality and good size, and the Williams produced very well and were in great demand by the markets. They were beautifully flavoured and slow to ripen (fast ripening of Williams pears can be a problem for retailers). The severe restriction on water during that period necessitated changes in management techniques. Irrigation water had to be severely rationed. Lynton would cultivate and leave the ground fallow for as much as two months to conserve the moisture in the soil, much as a wheat farmer might cultivate and leave the ground fallow over summer to conserve moisture. The summer green manure had to be left out so that the trees could go longer between irrigations. This was obviously not ideal and the soil to became a little finer and less structured as a result. Some areas required a little manure because of the limitations on green manuring. One upside of the drought was that the springs were relatively dry, reducing the risk of black spot. Lynton normally follows a preventative program, spraying lime sulphur during winter or at bud swell, following up with wettable sulphur until flowering. 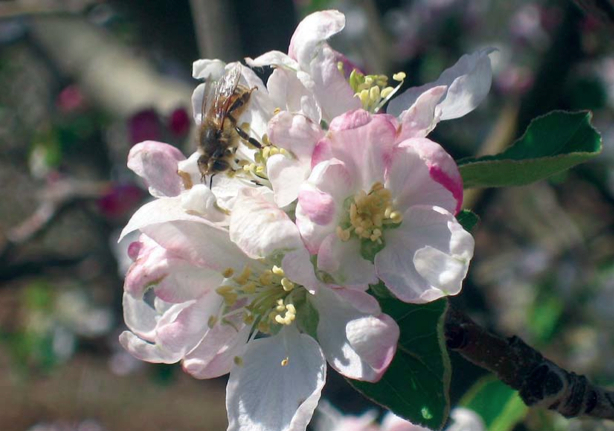 This generally keeps black spot under control, and as long as the orchard is kept clean in spring, any summer rain does not pose a threat, but can be a huge benefit for fruit development. Lynton has used a wide range of methods against codlin moth over the years, including neem, garlic, pheromone confusion, trichogramma wasps, dipel and lights with water traps. 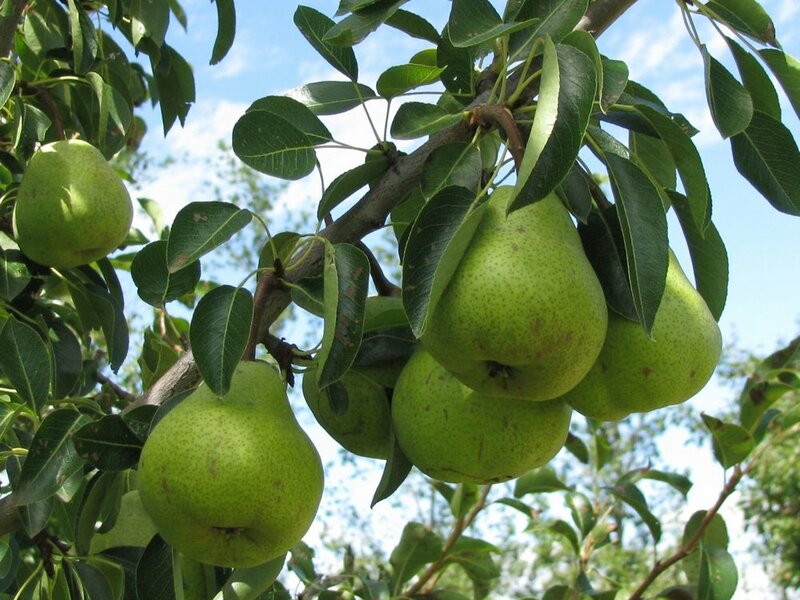 In the past, pears struck by codlin would ripen prematurely on the tree, causing problems at harvest – pears are picked and stored hard, ripening when removed from the cool store. Codlin struck (consequently ripe at picking) pears squash in picking bags and in grading machines, causing a lot of extra work. Now, codlin moth is less of a problem. Codlin moth strike has declined noticeably over the years. A home block of pears that was not treated at all, also showed a marked decline in codlin. Lynton says that the environmental vitality developed with Biodynamics over 53 years has greatly strengthened the trees. When a codlin moth attacks a fruit, it now has enough stamina to heal itself, will not ripen, and is marketable. Similarly if there is a bit of black spot, it now doesn’t distort the fruit as it used to – the pear will keep growing under the spot. The orchard is home to a healthy population of natural predators – over the last 20 years, a real balance seems to have come about in the orchard with regard to pests. Lynton has very few problems with the insects that bother conventional orchardists, such as apple moth, San Jose scale, two spotted mite, mealy bug, thrip, dimple bug and looper. Pear and cherry slug can be a bother at times. Lynton has found that natural pyrethrum made in Tasmania (without piperonyl butoxide) is the most effective control, but uses it very discreetly to avoid damaging the natural predator population. He is prepared to accept up to 20% damage to the leaves from pear and cherry slug. Too much damage has repercussions for the next season’s crop. Again the progressive strengthening in the environmental health of the orchard seems to have brought a degree of control over this pest. Sadly, two years ago Queensland fruit fly spread to the area, infecting Lynton’s trees. Lynton quickly had to learn how to deal with this new and substantial threat. Up to 6000 fruit fly traps have been installed in the orchard and a range of other natural methods trialled to combat the fruit flies. It is a work in progress! 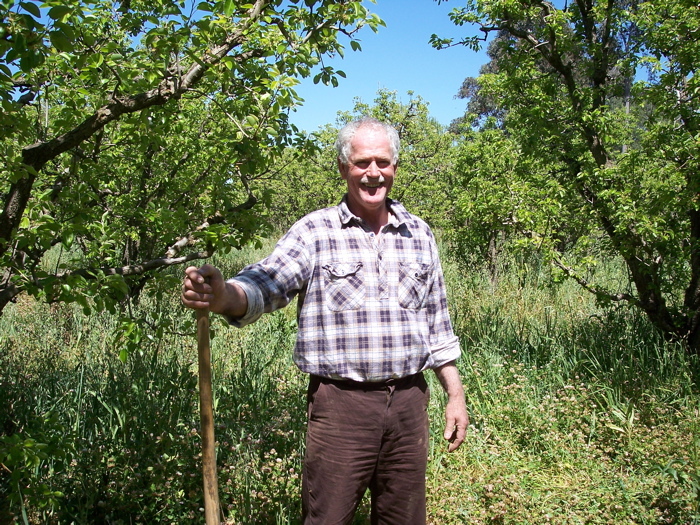 Lynton uses a number of distributors, the largest being the Biodynamic Marketing Company, which sends his pears and apples to most Australian states. Apples are becoming harder to market as more and more conventional growers convert to organics, bringing a glut to the market. Lynton makes some of his fruit into beautiful Biodynamic juices: pear, apple, and apple/pear. The juices have no additives and are pasteurised at the lowest possible temperature. I first tasted a Greenwood’s pear in 1971 and still remember my amazement at the beautiful flavour. It was the first time I had tasted Biodynamic fruit. I stayed briefly with Farry and Audrey in the early 1980s and remember Farry showing me his annual test – on the mantelpiece of the kitchen were two saucers, one with one of Farry’s pears, and one with a neighbour’s pear. They had been there for several weeks. Farry’s pear was still in perfect condition, but his neighbour’s had completely rotted. Farry told me he did this every year to test the quality of his pears. Lynton says that the orchard has a life and character of its own, and has had a profound impact on many people over the years. People write or visit years later and comment on how much they learnt about Biodynamics from visiting and working on the orchard. The orchard is a family affair: Joan and Lynton’s youngest son, Alex, works on the orchard; eldest son Joel lives across the road from the orchard but runs his own earthmoving business, and is often called upon for engineering repairs - he is keenly interested in the orchard, and has recently bought the neighbouring dairy farm which he is converting to Biodynamics; and Lynton’s sister Debbie does the books and helps Joan and Lynton host the BDAAA annual conferences which have been held at the orchard every April since 1987.